It was a heavenly experience to be young and juvenile at the time of independence, since our founder, Late Surendranath Banerjeee realized the most significant aspects of higher education amongst the youth of Bengal as well as India. That was indeed bliss to be alive at the dawn of independence in India on August 15, 1947. Surendranath Banerjee (From November 1848 to 6th August 1925) was one of the great stalwarts of India’s freedom movement .In addition to being a great patriot, he was a polymath, orator and statesman. As a visionary, he realized that education was the weapon to fight the evil of colonialism and attain the sovereignty of mind. Surendranath Banerjee was one of the great pioneers in the history of India’s freedom movement. He is regarded as a great patriot, scholar, orator and statesman. As an educationist he devoted himself wholeheartedly to the cause of higher education in the country. 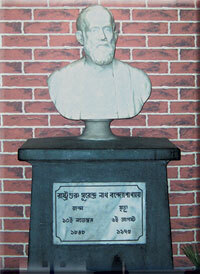 In 1882, Surendranath Banerjee took over the charge of Presidency School. Early in 1884, this school was converted to Presidency Institution affiliated to LA. standard. Later in the same year it became a degree college named ‘Ripon College. In 1885, a Law department was added and a new college took shape as Ripon Law College. In 1948-1949, two years after attaining independence in 1947, Surendranath College was formed, named after the illustrious founder. The establishment of the Commerce section in 1940 and the Evening Science section in 1947 eventually made way to the formation of SURENDRANATH EVENING COLLEGE in 1961.